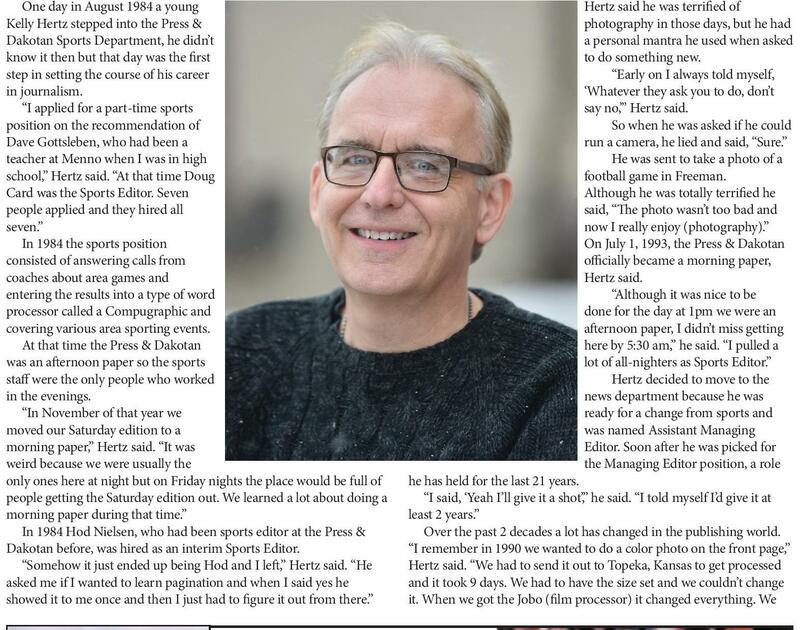 The Faces of the Press & Dakotan – Kelly Hertz One day in August 1984 a young Kelly Hertz stepped into the Press & Dakotan Sports Department, he didn’t know it then but that day was the first step in setting the course of his career in journalism. “I applied for a part-time sports position on the recommendation of Dave Gottsleben, who had been a teacher at Menno when I was in high school,” Hertz said. “At that time Doug Card was the Sports Editor. Seven people applied and they hired all seven.” In 1984 the sports position consisted of answering calls from coaches about area games and entering the results into a type of word processor called a Compugraphic and covering various area sporting events. At that time the Press & Dakotan was an afternoon paper so the sports staff were the only people who worked in the evenings. “In November of that year we moved our Saturday edition to a morning paper,” Hertz said. “It was weird because we were usually the only ones here at night but on Friday nights the place would be full of people getting the Saturday edition out. We learned a lot about doing a morning paper during that time.” In 1984 Hod Nielsen, who had been sports editor at the Press & Dakotan before, was hired as an interim Sports Editor. “Somehow it just ended up being Hod and I left,” Hertz said. “He asked me if I wanted to learn pagination and when I said yes he showed it to me once and then I just had to figure it out from there.” he has held for the last 21 years. “I said, ‘Yeah I’ll give it a shot’,” he said. “I told myself I’d give it at least 2 years.” Over the past 2 decades a lot has changed in the publishing world. “I remember in 1990 we wanted to do a color photo on the front page,” Hertz said. “We had to send it out to Topeka, Kansas to get processed and it took 9 days. We had to have the size set and we couldn’t change it. When we got the Jobo (film processor) it changed everything. We It pays to double checkTM. Let’s take a timeout and talk about a Discount Double Check®. It could save you big. Rhonda L. Wesseln, Agent CONTACT ME TODAY. Yankton, SD 57078 Bus: 605-665-4411 www.rhondainsuresyou.com rhonda@rhondainsuresyou.com 1506562 12vHISVOICEvJANUARY/FEBRUARY 2018 Hertz said he was terrified of photography in those days, but he had a personal mantra he used when asked to do something new. “Early on I always told myself, ‘Whatever they ask you to do, don’t say no,’” Hertz said. So when he was asked if he could run a camera, he lied and said, “Sure.” He was sent to take a photo of a football game in Freeman. Although he was totally terrified he said, “The photo wasn’t too bad and now I really enjoy (photography).” On July 1, 1993, the Press & Dakotan officially became a morning paper, Hertz said. “Although it was nice to be done for the day at 1pm we were an afternoon paper, I didn’t miss getting here by 5:30 am,” he said. “I pulled a lot of all-nighters as Sports Editor.” Hertz decided to move to the news department because he was ready for a change from sports and was named Assistant Managing Editor. Soon after he was picked for the Managing Editor position, a role State Farm Mutual Automobile Insurance Company, State Farm Indemnity Company, Bloomington, IL.